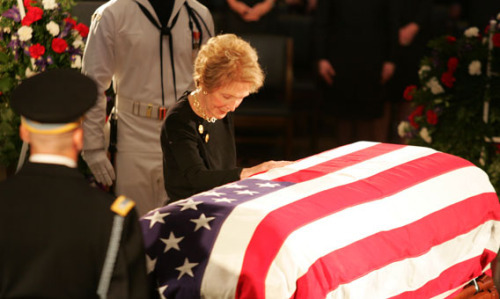 As First Lady of the United States, Nancy Reagan served the people of this great nation with grace and humility. She has been an inspiration to all of us who worked for her at the Ronald Reagan Presidential Foundation and she will be deeply missed. The Reagan family, our Foundation and this country have lost a treasured soul. Mrs. Reagan will be buried at the Ronald Reagan Presidential Library in Simi Valley, California, next to her husband, Ronald Wilson Reagan, who died on June 5, 2004. To prepare for her funeral, the Ronald Reagan Presidential Library, located at 40 Presidential Drive in Simi Valley, California is closed, and will re-open to the public on Sunday, March 13, 2016 at 10:00 a.m.
As part of the official events, Mrs. Reagan will lie in repose at the Ronald Reagan Presidential Library on Wednesday, March 9th from 1:00 p.m. to 7:00 p.m. and also on Thursday, March 10thfrom 10:00 a.m. to 2:00 p.m. No parking will be allowed at the Reagan Library. If you wish to pay your respects to Mrs. Reagan, transportation will be provided for the public at the former Bank of America property located at 450 American Street, Simi Valley, California. Shuttles will run continuously to the Reagan Library throughout those hours. Because security will be heightened at the Library during this time, no large bags or cameras will be permitted and all bags will be inspected. Strollers will not be allowed inside the building. Gifts and flowers will only be accepted at the bottom of Presidential Drive and at the shuttle pick up location. Funeral services will be held at 11:00 a.m. on Friday, March 11, 2016. Funeral services are closed to the public. 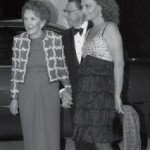 In lieu of flowers, Mrs. Reagan had asked that contributions be made to the Ronald Reagan Memorial Fund at www.reaganlibrary.com. First Lady Nancy Reagan with her husband, President Ronald Reagan, circa 1980s. If fashion can be defined as a universal language expressing who we are and where we are going, then Nancy Reagan spoke it fluently, with a radiance and grace that defined a presidential legacy. Like a late 20th century vignette of Camelot, the Ronald Reagan Presidential Library and Museum opened its new exhibit, “Nancy Reagan: A First Lady’s Style” on Nov. 10, 2007 in Simi Valley. Highlights from a collection that spans more than 50 years are showcased, beginning with the former first lady’s 1952 wedding dress and ending with the suit she wore for President Reagan’s funeral in June 2004. Weeks before last Thursday’s red carpet gala celebrating the opening, the exhibit’s designer, Russ Jenkins, was on hand to give visitors an early glimpse of the collection. “She was a tremendous example of a first lady,” said Jenkins, owner of WRJ Design Associates LLC, as he thumbed through the pages of a pictorial book that will be available for purchase at the presidential library. The colorful book puts into context many of the fashions that will be on display through November 2008. 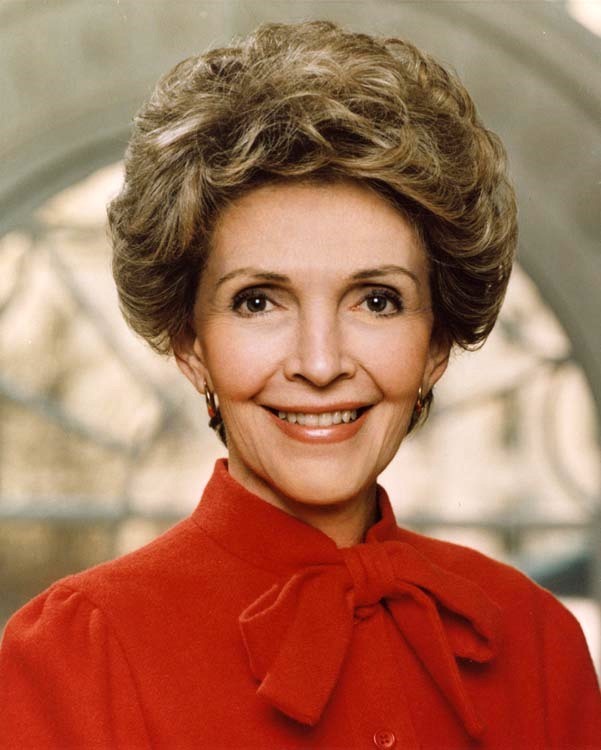 Indeed, Nancy’s style and grace during the Reagan years of the 1980s may well have served as an elegant reflection of her husband’s magnanimous optimism. “The public will be able to see the beauty of her gowns that she wore during their travels and wonderful dinners,” Jenkins said. “The dresses are absolutely spectacular and show the history and legacy of Mrs. Reagan,” he added. Imagery and architectural elements relating to the White House will carry the audience through the exhibit and highlight historic milestones. The focus will be on Nancy Reagan’s duties as first lady, her philanthropic endeavors and the love story that she and the president shared. Jenkins noted that the first lady’s collection will include pieces by James Galanos, Caroline Herrera, Oscar de la Renta, Geoffrey Beene, Bill Blass, Valentino Garavani, Adolfo and Yves Saint Laurent. “Through her generosity in donating most of her closet, Mrs. Reagan has given us a wonderful opportunity to understand her role of representing our country. She was a tremendous first lady,” Jenkins said. 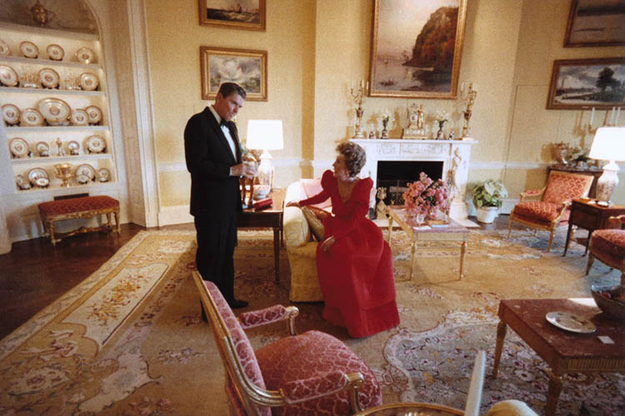 “The display also showcases the incredible talent of the American fashion designer, while reflecting Mrs. Reagan’s taste and eye for style,” he continued, noting that in 1988, the Council of Fashion Designers of America bestowed its Lifetime Achievement Award upon Nancy Reagan. The book also serves to reflect on the Reagan’s romance – starring two star-crossed lovers whose biggest double-billing played out on the world stage for all to see. In a written statement, the former first lady and actress, who went on to become an icon of American couture fashion, expressed her gratitude for the privileges she enjoyed during her White House years. “I am delighted that these designers are being recognized for their incredible talent. It was an honor to wear each of these pieces, and every gown, dress and suit brings back wonderful memories, moments in my life that I will remember and cherish forever,” Nancy Reagan said. Diane von Furstenberg served as master of ceremonies at the celebrity-studded private reception that opened the exhibit on Nov. 8. 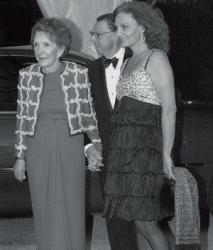 An honorary committee included fashion luminaries Galanos, Herrera and de la Renta. Story originally posted in 2007. All rights reserved.